Despite professionally trained in cloth making & craftsmanship his work is described as experimental and conceptual. He explores the past and future of clothing by blending traditional clothing making techniques with unconventional materials & silhouettes. For this series DANCER IN THE DARK Shanghai has created a conceptual fashion collection inspired by the 2016 Met Gala “Manus × Machina: Fashion in an Age of Technology.” As a starting point for his designs he considered structures and shapes formed by machinery, which tends towards straight lines instead of curves. The final pieces however are all formed painstakingly by hand. In the world of fashion this represents a long-established tension between industrial and mass-produced clothing, made accessible and popular by being affordable, and “haute couture,” carefully refined through hand-made materials, which are unique pieces and considered expensive and a luxury. This dichotomy allowed Shanghai to explore creatively unconventional materials, both handmade and machine-made. The result is a fashion collection that draws us into the future of what could be. Shanghai Chang (b. 1996, Phnom Penh, Cambodia) is a fashion design student from Limkokwing University of Creative Technology. This series of architectural drawings by Chhum Limhay explores imaginary cities of the future, inspired by real cities around the world and their historical legacies while employing science-fiction aesthetics. The formation of cities and urban culture is rooted in its ancient heritage, which, as a result, affects the design of buildings, infrastructure and how people live in them. In each drawing there is a distinct absence of people, plants and vehicles. Limhay has chosen to focus specifically on the shape and design of the buildings laid out across a symmetric grid. Believing in the optimism of technology, the artist proposes a city-scape that is carefully constructed and harmonious. In his imaginary cities, he sees people from all backgrounds living together peacefully. Chhum Limhay (born. 1996, Phnom Penh, Cambodia), is a Business Administration senior from Zaman University. The third generation of Zaman’s graduates in the year of 2017. Limhay’s work as an artist is inspired by both history and technology. He likes to draw things that are impossible. In addition to illustration, and his business studies, he is currently involved in an animation project. Despite that, or perhaps because of it, Lymei felt compelled to show this work as a personal statement of artistic sincerity but also to encourage her fellow artists not to be pressured to conform to social expectations. SUN Lymei is a graduate from Zaman University with a degree in Digital Arts and Design. She is also a young entrepreneur and runs her own business called FiiT. As an artist she is inspired by artists Pablo Picasso and Keith Haring, but draws on her own life experiences to create the characters and compositions. Her other work includes life drawings and studies of the human figure. This series of prints by Srun Rida explores memories of pre-war and war in Cambodia as told to him by family members. Objects, clothing and buildings are rendered in textured, black and white prints – each with a unique story and symbolic meaning. When he was young, Rida remembers his mother and uncles talking about what they lived through during the Khmer Rouge. At the time he felt that this was a part of history that no one wanted to remember. But much later, after doing his own research, he considered these stories an important part of history – and that although nobody wanted to relive them or experience them again, it is important that each new generation remembers. It is for this very reason that Rida has created visual images to document these (hi)stories and honor those who have survived. In addition to this series, Rida presents his portfolio of prints that range in styles and showcase a variety of techniques and subjects. He employs several different printing methods including lithography, etching, woodcut and woodblock printing. Lithography uses stone or aluminum plates, on which the artist draws an image with a waxy material and by applying ink to the image it is transferred to paper as a “mirror” version of the original. While etching, similarly uses ink applied to a copper plate and transferred as a “mirror” version of the original, the image, instead, is “cut” from the plate using acid. Finally, woodcut and woodblock prints are relief prints that are produced from the raised surface of wood that remains after an image is carved from it. After ink is applied across the surface the areas that are carved, or taken away from woodcut and woodblock, remain light in the print while the rest is the color of the ink – much like a stamp. Srun Rida is a recent graduation from the Royal University of Fine Arts, where he studied with master at the Char Studio printers to develop his artwork. He has participated in several competitions and group exhibitions including “Chruy Changva Area II (a disappearing context),” Bellevue Serviced Apartments (2017), “Woodblock Prints,” Meta House (2016), and “Daily Life,” Artillery Café (2015). “Remember,” Java Creative Cafe (2017) is his first solo exhibition. 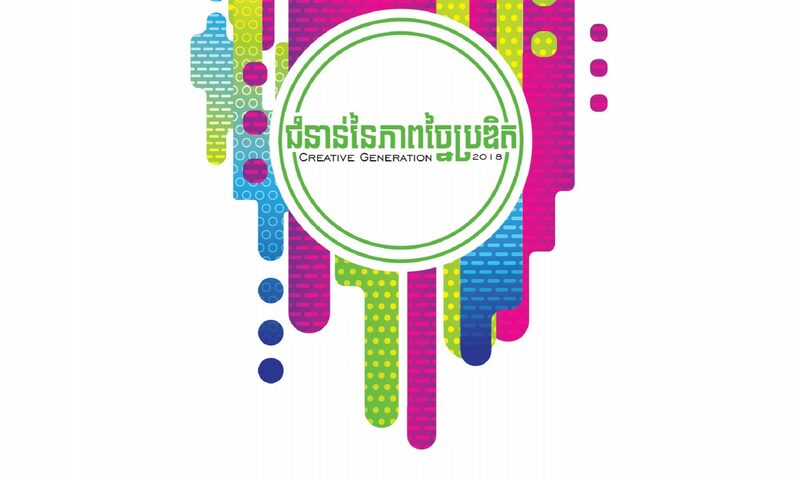 Char RUFA is a voluntary run non-profit organization based at the Royal University of Fine Arts of Cambodia. The etching and lithography workshop provides young talented artists with high quality art training and opportunities for professional mentoring, support and international exchange. With support of the international art community and Mexican Art collective Tequio Oaxaca. This exhibition focuses on the works of architecture students that have been left behind and reflects on the learning and creative process. The exhibition features sculptured objects, collage, and sketches that range in subject and style. The group of architecture students collected works that were left behind that seemingly had neither value nor any interest at that time. For this exhibition, they brought those abandoned pieces of artworks together and by repetition, re-composition and creating relationships between the objects they have given the works new purpose and meaning. Together, they reflect on what the students have learned and how they work, so along the long wall divides into 3 parts: statues, buildings and human, under the main titles “What we have learned ”, all are sketch, watercolor sketches, drawings that hanging with the wood clip. Through “Khmer Houses”, they are show graphic board print of the Khmer housing design with poet written by Mr. Ven Son with pencil sketch to describe Khmer house that we have from ancient times. And then “Thousands of Pieces ”, it created from lots of artwork on the papers left behind, the meaning doesn’t complicated, they just wanted to show that the papers also can make something beautiful, nice and inspire. The medium is just the papers roll it into small pieces and put it on the black board. Finally “Reflection ” shows about Kbach Khmer with clay that made it by hand, some broke but it fixed by glue and it became together again. It’s hanging from the wall and also lay around with the black background behind. It shows about the scar inside the mind, patient, problems, sadness … but all those darkness also can fix and will help us to the find our self, the black background likes the mirror to reflect what we had fact in the past is the lesson to learn and make us more stronger, move forward to the future with the confident. The exhibition will give the audiences an idea of what architecture students learn, how they repurpose materials, create spaces, propose self-directed solutions and use imagination. The architecture students are Buth Khemera, Chhang Sreyneath, Den Koemsrim, Doeur Tola, Heng Meng Kong, Horm Chenda, Meoun Visal, Met Monthary and Yin Dina. They are all from National Technical Training Institute. All artworks are not for sell.